The impact of pregnancy is not lost on dads, although it seems that men are sometimes programmed to handle it differently than women. They also might need suggestions for how to get involved in the pregnancy. 1. Write a note or make a video for your future child. This can be kept private or shared with your partner, family or friends. Write or speak in first person. Address yourself as “I” and baby as “you.” This will help you get your feelings out about what you're looking forward to and what you're scared of. It will also help humanize the baby. 2. Ask Your Partner Questions. The best way to understand how mom is feeling (both physically and emotionally) is to ask her questions. Ask what it feels like when the baby moves, ask about her visions of childbirth, ask how she's feeling physically. 3. Share Your Feelings with Your Partner: Having a baby is an exciting time, but it's something that changes your life forever. Joy, excitement, fear and/or anxiety are all valid feelings and your partner will likely share in a few of them. 4. Learn about pregnancy and childbirth. Read about the physical changes and symptoms your partner is experiencing and imagine yourself in her shoes. Find out what activities she can and can't do, and write them down if you need to. Having the knowledge of childbirth options and procedures will make you all the more invested and qualified to take part in important decisions. 5. Go to prenatal classes. Seek out father-only classes and attend if they're available. Attend the pregnancy and childbirth classes with your partner. Prenatal classes provide a great opportunity to learn about the birth and talk through your own concerns in a support group-like format. 6. Go to prenatal appointments with your partner. The early appointments may make it seem that you don't really need to be there. But they get more exciting as the pregnancy progresses, and mom will appreciate having a second set of ears to take in information and help make decisions. 7. Read all about newborn babies and parenting. Believe me, the unknown is far scarier than any information you read in The Happiest Baby on the Block or Baby 411. Understanding how to soothe and care for a newborn will give you much-needed confidence to jump right into fatherhood when the baby is born. If you're not a reader, watch the DVD or download an audiobook. 8. Plan paternity and maternity leave with your partner. Discuss how much time you each want to take off from work, and talk about your expectations for your partner. 9. Do pregnancy-approved exercises and workouts with your partner. Exercise is good for the mom-to-be, and you'll provide motivation and support when she's not feeling like exerting herself. 10. Be present at the birth and be ready to hold your new baby! 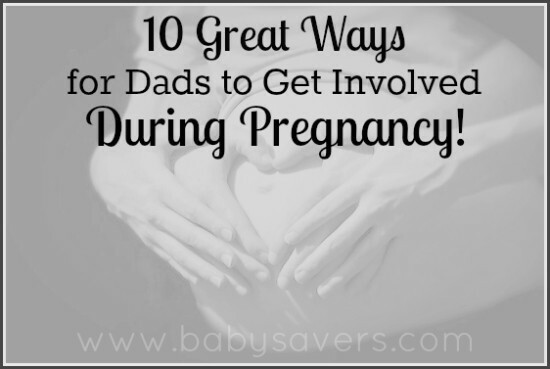 Readers: What suggestions do you have for helping dads take an active role during pregnancy?